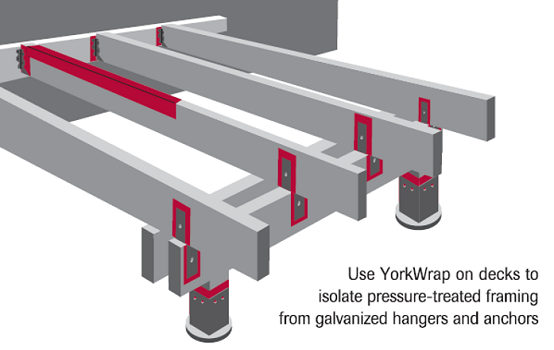 YorkWrap™ Non-adhesive Polymeric Isolation Tape* is a fexible, 20 mil. thick PVC membrane designed to isolate ACQ pressure treated lumber from galvanized metals – an economical way to prevent the corrosive effects of incompatible materials and stop potential moisture problems. YorkWrap™ also provides superior moiusuture protection for decking applications. Corrosion can happen wherever pressure treated lumber comes into contact with galvanized metal. Because that can happen is so many places – at all joist and post anchors, and skirt boards of steel-sided buildings – it’s a good idea to complement your flashing with our latest innovation. *YorkWrap™ is not a substitute for flashing and is not warranteed as such. It is an isolation membrane designed to use in conjunction with flashing.